The TI-5000 started in 1982 a new generation of miniature printing calculators. At first glance the TI-5000 remembers the TI-1766 developed and manufactured by Toshiba in Japan. We notice similiar keys, similiar coloring of the housing and an identical text font. Dismantling the TI-5000 reveals indeed a masterpiece of Japanese engineering, probably from Toshiba. The internal construction and layout of the components looks even 20+ years after its market introduction perfect to us. The printed circuit board (PCB) of the TI-5000 is populated with a single-chip calculator circuit manufactured by Toshiba, the LC-display and a small single-inline printer driver. The thermal printer was manufactured by EPSON, Japan and found its way in other calculators like the TI-5008 and the rare TI-45 MSP. The paper used with this printer (PMF05228 1-1/2" wide and 14 Feet length) is still available at different sources, e.g. shoplet.com. 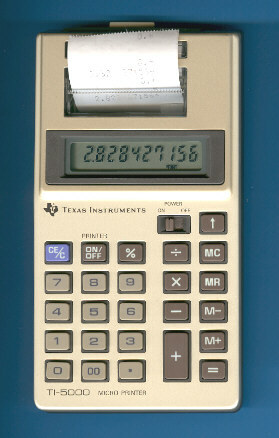 The TI-5000 is featured in the Texas Instruments Incorporated leaflet CL-199M dated 1983.